The NFHS Topic Selection Meeting was held in Orlando, FL on August 4-6, 2017. It was a wonderful meeting and Kansas was well-represented! 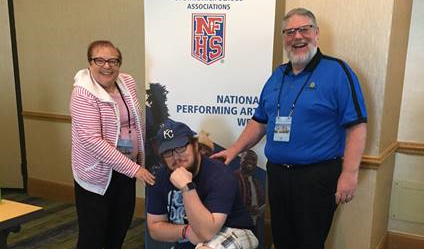 Listed in the picture from L-R are: Pam McComas, Wording Committee (third time in her career); Dustin Rimmey, Topeka High School Debate Coach and a 2017 Topic Writer and Presenter; Dustin's Supreme Court topic advanced to the ballot with the final 5 topics that will advance to the national vote; and Craig Manteuffel, KSHSAA Assistant Executive Director of Fine Arts and Kansas voting delegate.